FILE - Secretary of Defense Jim Mattis, responds to a reporter's question at the Pentagon, Sept. 19, 2017. Defense Secretary Jim Mattis is in South Asia for the first time since the White House unveiled its new strategy for the U.S.-led war in Afghanistan. The Pentagon chief landed Monday in India’s capital, where he will meet with senior leaders, including Indian Prime Minister Narendra Modi. Mattis is hoping to deepen Washington’s quickly growing defense relationship with New Delhi. One area of cooperation could be Afghanistan, where the U.S. is in a deadlock with the Taliban after 16 years. President Donald Trump has called on New Delhi to do more in Afghanistan – a call that has upset New Delhi’s longtime rival, Pakistan. On his flight, Mattis praised India’s “invaluable” historic contributions to Afghanistan, and said its expanded involvement there shouldn’t be seen as a threat. “Pakistan has come out recently again saying they are fighting the terrorists. I think Pakistan will find nothing out of line with India and the United States’ alignment in the same fight,” Mattis said. Mattis’ trip threatens to be overshadowed by the tensions on the Korean peninsula, where North Korea has threatened to conduct an atmospheric hydrogen bomb test over the Pacific Ocean. “This would be a shocking display of irresponsibility toward global health, toward stability, toward non-proliferation,” Mattis said. President Trump last week threatened to “totally destroy” North Korea – escalating the standoff over Pyongyang’s nuclear and missile programs. But most of Mattis’ trip is expected to focus on South Asia. Mattis does not plan to visit Pakistan during his trip. But U.S. officials deny that is meant as a slight to Islamabad. “The relationship we are building with India is not to the exclusion of other countries,” said Mattis. But many in Islamabad still object to any Indian involvement in Afghanistan. Nonetheless, India is cautiously moving forward, agreeing earlier this month to provide additional assistance to the Afghan defense forces. 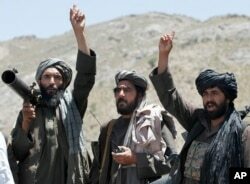 The country has already provided more than $2 billion in economic aid to Afghanistan. Most of that aid has been on the soft side – such as in the health sector, education, and infrastructure. India has also helped Afghanistan build its new parliament building, for instance. The U.S. and Afghanistan have long accused Pakistan of supporting certain Afghan militant groups - a criticism now echoed by the Trump administration. But many fear Islamabad could actually increase its support for the militant groups if India becomes more involved in Afghanistan. It’s a contradiction inherent in the Trump administration’s Afghanistan policy, and it will be difficult to resolve, warns Shamila Chaudhary, who worked on South Asia policy at the National Security Council in the Barack Obama administration. 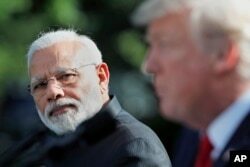 FILE - Indian Prime Minister Narendra Modi looks toward President Donald Trump as he speaks in the Rose Garden at the White House. During his visit to India, Mattis is also expected to deepen a bilateral military relationship that has grown rapidly in recent years. In 2016, the U.S. declared India a “Major Defense Partner,” a unique label that gave it access to a wider range of U.S. military technologies. In 2008, U.S.-India defense trade stood at roughly $1 billion. If current deals being negotiated were to go through, that could increase to nearly $19 billion. It isn’t clear if any weapons deals would be announced during Mattis’ trip, but U.S. officials hope the meetings will help put the “Major Defense Partner” status into practice. “The relationship between India and the United States has never been stronger, and I think that’s pretty much an objective fact,” Mattis said. The partnership has taken on greater importance, especially with China’s growing military assertiveness and economic clout.